At last the water level is back to normal and by now all the work on the canal should be finished. 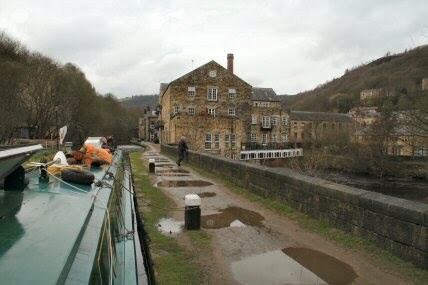 We took the boats down through the lock so that we could turn around at the small wharf in the middle of Hebden Bridge. Tim was going to water up but someone beat him to the point and at the pressure that this water is under would have taken all day to get away. Back through the lock and Tim went ahead to set up the next lock. We seem to have been here for ever and it is nice to get moving again. 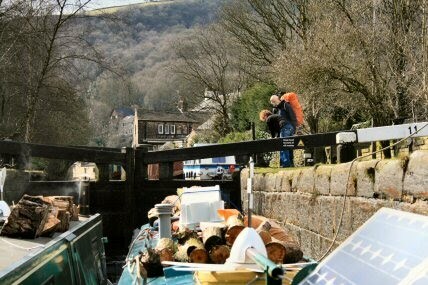 As we went through the pair of locks with a pound in-between we met up with George. 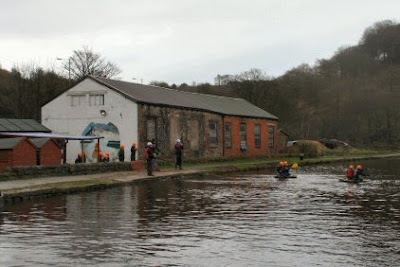 We first met her on the mooring at Brighouse. The name of her narrowboat is nb *£&%£$£ she said. Very unconventional but as she didn't want to name her boat seems fair enough to me. The gentleman walker is someone that is doing the Pennine Way and we were all on the same route for a while. 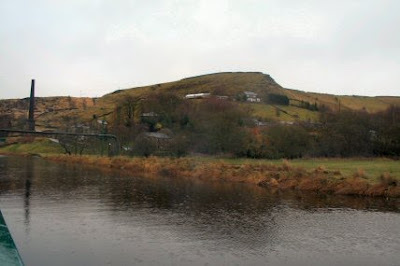 We stopped the night at the limit of our previous trip up towards Todmorden. 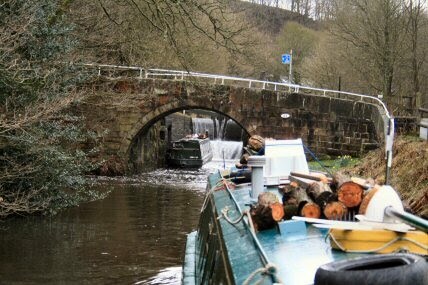 Even with the excess water knocking about the bottom of the boat keeps touching the canal bed. Its in dire need of a dredge I should think. Each of the locks as we go up has water coming over the gates. We kept well away from the upper gates as I didnt want to give the carpet another wash!! By the time we had stopped for the night it was belting down with rain and as soon as we could get alongside we did. 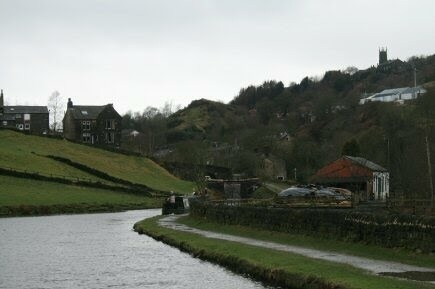 This morning was cold and cloudy but not raining so it was back on the trip to Todmorden. When we reach Lobb Mill Lock along with the snow that is coming down on occasions the water doing its thing over the gate. It started snowing in earnest as we entered the lock. The hills around us all have a covering of snow and they are not a lot higher than we are. Those few feet in height make all the difference to the weather. From the lock I looked back and watched a group of school children having a go at paddling their way across the canal. Its very cold but by the volume of noise they are certainly enjoying themselves. Nice to see. A view from the bows at tonights mooring. Up there somewhere is Stoodley Pike. A BW pusher (might have been Rishton) went past earlier. On the front was an empty barge. I hope they are going to fill it with canal bottom.